Louis Vasquez and Nick Hardwick, the Right Guard and Center for the San Diego Chargers, make up the only part of the offensive line that nobody is worrying about. With a new 3-year contract and the departure of LG Kris Dielman, Hardwick is now unquestionably the leader and best offensive lineman that the Bolts have. Vasquez is a slightly different story. Just as you would hope, Louis Vasquez has become a better and more consistent player in each of his three seasons in the league. There's no reason to think that the Chargers should expect anything less than what he provided in 2011, which was a near Pro Bowl-level of performance as a pass blocker and solid output as a run blocker. ProFootballFocus.com had Vasquez ranked as the 32nd best Guard in the league in 2011, and tracked him as only allowing 1 sack all season. Kris Dielman, the former anchor of the line from the Left Guard position, left big shoes to fill. Vasquez will probably be asked to help fill a lot of Dielman's old responsibilities, and will try to provide the same sort of leadership and toughness. If he fails at this, or struggles to stay healthy, he may be playing for another team in 2013. This is pretty simple. 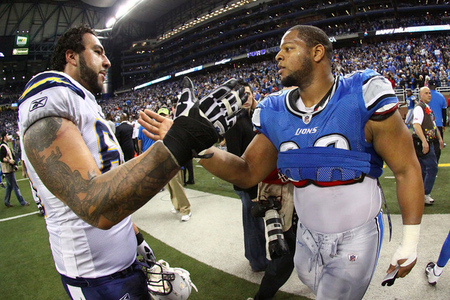 Vasquez signed a 4-year deal for $2.55 million after being drafted by the Chargers in 2009. The upcoming season will be the final year of that deal. If he has a good year, Vasquez will be looking for a contract that's about 5 years long (or longer) and worth $30-40 million. That's quite a raise. There's not a ton of money coming off the books for the Chargers after this year, either. Most of their stars are locked into deals that go beyond next season. The biggest possible free agents for the Bolts are Shaun Phillips ($4.4 mil), Nate Kaeding ($2 mil), Atari Bigby ($2.5 mil), and Malcom Floyd ($2 mil). Keeping Vasquez might mean losing Phillips and one of those other three. Vasquez has been the starter since Day 1, but that doesn't mean he's started every game since being drafted by the Chargers. In fact, in three seasons he's yet to complete a season without missing some games due to injury. In 2010, he played in just 10 games. Missing games, even just a couple per season, when you're in your mid-20s is usually a sign that you'll miss even more in your late 20s and early 30s. If Louis wants a long-term deal for big money from San Diego, he'll have to prove that he can start all 16 games this season without a serious injury or drop in performance. The final year of any player's rookie deal is an important season in the grand scheme of their career impact and career earnings. The new Collective Bargaining Agreement makes first-round offensive linemen much cheaper than they used to be, which makes players like Vasquez much more replaceable if the team believes the price tag to be more than the value. For Vasquez to remain with the team in 2013, he'll either need to prove himself to be consistent and invaluable to the offense or he'll need to play poorly enough that the Chargers sign him to a cheap deal and let him battle for the RG spot next year. I believe everyone, from Louis to A.J. Smith to the fans, are rooting for the first of those two scenarios to come true in 2012.